The Cambodian National Petroleum Authority (CNPA) was formed in accordance with Royal Decree ChorSor/RorTorkor 0198/020 dated 22 January, 1999. The CNPA is responsible for all matters related to the regulation and management of Cambodia's petroleum sector. The CNPA is under the direct authority of the Prime Minister and lead by Chairman H.E. Mr Sok An. H.E. Mr Sok An has the full responsibility and authority to manage CNPA. Furthermore, the Chairman is responsible for providing advice and recommendations on policy guidelines as well as coordinating the business of petroleum exploration and development in both the upstream and downstream activities sections. To facilitate onshore and offshore operations in Cambodia, CNPA provides policy proposals and draft legislation for approval by the Prime Ministers Cabinet . The CNPA is managed by both the Board of Management and an Executive Team. The Board of Management comprises H.E. Mr Sok An (Chairman), H.E. Mr Ho Vichit (Vice Chairman), H.E. Mr Ung Richard Ponnara (Vice Chairman), and H.E. Mr Te Duong Tara (Director General), and the Legal Team. The Executive Team is led by the Director General and comprises four main departments (Upstream Department, Downstream Department, Legal and Negotiation Department, and Administration and Finance Department) and three expert working teams (Laboratory Expert Team, Health, Safety and Environment Expert Team, and Research Information Expert team). With regard to Cambodia's energy industry all petroleum products for Cambodia are currently imported as there is no indigenous production. However, recent years have shown increased development in production, downstream storage, transportation, and retailing of hydrocarbon products. In addition, Cambodia now has over 200 petrol stations in operation as well as highly prospective offshore acreages (yet to be fully explored). The history of oil and gas exploration in Cambodia dates back to the 1950’s when the first reported geological surveys of Cambodian territory were conducted by a team of Chinese geologists. In the early 1960’s, Polish geologists also conducted geological and structural mapping, locating some oil seep and outcrops as well as further identifying the country’s mineral. An Elf and Esso consortium undertook the first offshore drilling between 1972 and 1974. During this time, the consortium drilled three exploratory wells : L-1, B-1 and H-1 in an area of the Khmer Basin located roughly 100 to 200 km. off the coast from Sihanouk Ville. The exploration scene was then very quiet until 1987 when Russian and Cambodian geologists performed a geological and geophysical study, identifying seven sedimentary basins with oil and gas potential in onshore and offshore areas and dividing the areas into seven offshore blocks and nineteen onshore blocks. Following the introduction of new Petroleum Regulation in 1991, an initial Cambodian bidding round was announced, calling for bids on offshore and onshore blocks. Although foreign interest in the onshore was mute, Production Sharing Contract ( PSC’s ) were awarded to Enterprise ( blocks 1 and 2 ), Campex ( block 3 ) and a pairing of Premier Oil and Idemitsu ( block 4 ). As a result, a total of nine wells were drilled three wells Angkor-1, Koah Tang-1 and Apsara-1 were found amount of gas condensate and waxy crude oil with low sulphur contents. And Da-1, Bayon-1, Poulo Wai-1 and Koah Pring-1 exhibited oil and gas shows. By the end of 1998 , limited exploration success and collapsing world oil prices prompted all foreign companies holding the PSC’s to withdraw from Cambodia . At the same time Woodside Petroleum was awarded PSC’s blocks 5 and 6. Woodside acquired 5000 km of 2-D seismic lines under the initial two year exploration period by the PSC’s. Despite identified several prospective structures block5 was relinquished in 1999 and block6 in 2000. In 1999, Woodside entered into the Study Agreement with CNPA covering blocks I-IV and VII with the purpose to determine the prospectivity of those blocks and feasibility of developing the discovered reserves. 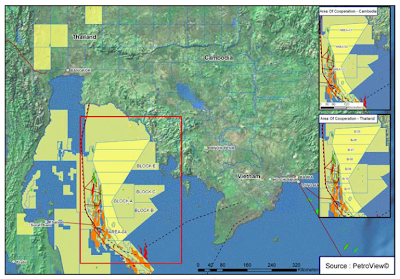 The result of the Study has shown that there is some potential for gas to be present in the area and model has been developed to assess the reserve potential of the area based on analogue from elsewhere in the Gulf of Thailand. 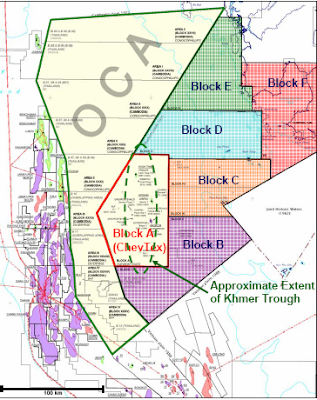 On 15th August 2002, the Royal Government of Cambodia awarded Chevron Overseas Petroleum (Cambodia) Limited (COPCL) a concession for the exploration and production of oil and gas offshore in Block A, an area covering 1.6 million acres (6,278 sq. km). The company is the operator of the block and currently holds a 55 percent interest. A five-well exploration and appraisal program commenced in September 2006 and was completed in December. As part of another drilling program, four additional wells are anticipated for drilling and completion in 2007. The need for additional drilling in 2008 and 2009 will be based on the results of earlier drilling campaign. As of early 2008, the results and prospects for further drilling were being evaluated. *** Now you may wondering why oil industries are taking too long to be accomplished? To understands this, you need to reach the tile and have a read on this "PETROLEUM REGULATIONS"
Block F : under negotiation with CNOOC Limited. 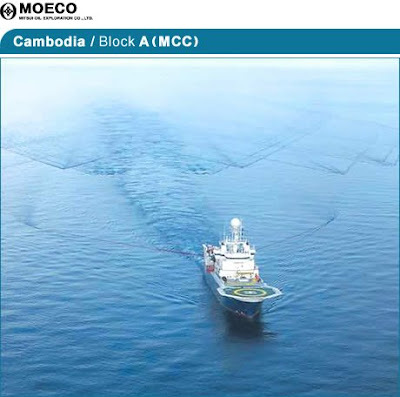 With its 30% interest, Moeco Cambodia Co., Ltd. (“MCC”) is engaged in exploration for oil, natural gas and condensate in Cambodia's offshore Block A in conjunction with Chevron Overseas Petroleum (Cambodia) Ltd. (55%: Operator, a subsidiary of Chevron Corporation) and with GS Caltex Corporation (15%). MCC drilled 9 exploration wells between October 2006 and February 2007 and the result of drilling are currently being evaluated. Based on the result of the evaluation, MCC is to make an exploration plan in the latter half of 2007 with the aim of early start up of commercial production. Lundin Petroleum has acquired a 34% interest in Block E from Medco International Petroleum, Kuwait Energy Company KSCC and JHL Petroleum Ltd. Completion of the transaction is subject to governmental approvals. 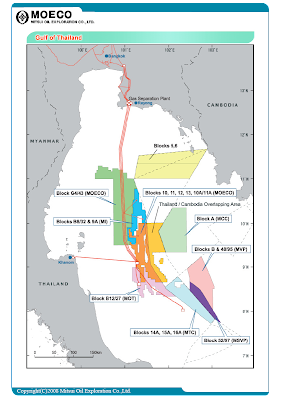 Block E covers 5,559 square kilometers and is located offshore Cambodia, in the Pattani Basin. The block contains several plays in addition to rift basin, fault traps and several structures have been identified. A 1,200-kilometer 2D seismic acquisition has recently been completed and is currently being processed and interpreted to define further exploration activities. Future plans include 250 square kilometers 3D seismic acquisition and one exploration well. In addition, Lundin Petroleum and Medco have agreed to work together in respect to certain future oil and gas opportunities in Cambodia. Medco serves as operator of Block E with 41.25% interest while Kuwait Energy Company holds 20.63% interest and JHL Petroleum holds 4.13% interest. Lundin Petroleum is a Swedish independent oil and gas exploration and production company with a well-balanced portfolio of world-class assets in Europe, Africa, Russia and the Far East. The Company is listed at the Nordic Exchange, Sweden (ticker "LUPE"). Lundin Petroleum has existing proven and probable reserves of 176.4 MMboe as of January 1, 2007. PHNOM PENH - Much international attention on Cambodia is focused on petroleum discoveries made by US supermajor Chevron offshore in the Gulf of Thailand. But the real prize is the overlapping claims area (OCA) further offshore to the west, an area long contested with Thailand. But no exploration has ever taken place over what all geologists say is definitely prospective for oil and gas because of the failure of the Thais and Cambodians to reach a sensible agreement as to how to resolve border issues. In principle, they have embraced a joint development approach, but this is not moving forward because of failure to agree on a division of the government revenues. To some advisers close to the Cambodian government, a major stumbling block is Thai intransigence. While the Cambodians are now prepared to make some concessions, the Thais are still not giving anything, wanting the lion's share of the benefits. Certainly, there can be a lot of national sensitivities involved in settling border claims, and both Thais and Cambodians have long memories of old hostilities. But Bangkok's attitude would not seem to sit well with all the talk in forums of the Association of Southeast Asian Nations of regional cooperation and good feeling, and also not in the context of the Asian Development Bank-promoted program to integrate the Greater Mekong Sub-Region economically. Just what Chevron has found in what are without dispute Cambodian waters is debatable. People may in fact be disappointed. All sorts of numbers are being bandied about, but Chevron itself is very tightlipped. Its Bangkok office says the sorts of numbers put forward by multilateral agencies, non-governmental organizations (NGOs) and media are speculative and do not come from Chevron. Where development goes in its offshore Block A is not clear. The map shown an Overlapping Consession Area- OCA Where still in disputed between Both Countries. After completion of a recent drilling round, Chevron said: "All data will be thoroughly analyzed over the next several months to recalibrate the pre-drill geological and geophysical models and to determine the ultimate resource potential in Block A." 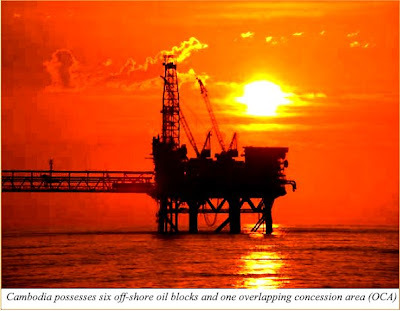 There are in fact counter-rumors now that the petroleum resources in the block, while maybe still at commercial levels, are far less than what has been anticipated. Time will tell. The government has tentatively put petroleum reserves in Block A at 700 million barrels. Better to shine the spotlight on the 27,000-square-kilometer OCA in the north of the Gulf of Thailand. Geologists say it is very prospective for oil and gas because it covers a continuation of structures that in adjacent and truly Thai waters have been producing large volumes of oil and gas for many years. This is a different geology from that under the Cambodian waters to the east of the OCA. Indicative of the OCA's prospectivity is that both sides have awarded blocks over the same areas to major companies. These include ConocoPhillips of the United States, Chevron (taking up blocks also held earlier by Unocal after Chevron acquired that company in 2005, as well as its existing prior interests in the OCA), BG (British Gas), Australia's BHP Billiton, and Japan's Idemitsu, Inpex and Moeco. None have relinquished their claims, pointing to the strength of the OCA's prospects. The origins of the OCA dispute date back to borders made more than a century ago between Siam and the colonial French government then ruling Cambodia and Laos as well as Vietnam. A result of this is that today in the northern part of the OCA, Cambodian- and Thai-claimed maritime borders are almost perpendicular to each other. Efforts to resolve the problem made some headway at the start of the decade when the two sides signed a memorandum of understanding in 2001 agreeing that a joint development regime could be established over the lower two-thirds of the area while the northern third could be developed once the maritime border could be delineated. But the road was still not easy, as Thailand insisted that this border delineation be achieved before a joint development area could be established. Discussions fell into limbo after the diplomatic breakdown in Thai-Cambodia relations in early 2003. This was caused by attacks on the Thai Embassy and property triggered by reported remarks by a Thai actress that Cambodia's revered Ankhor Wat temple complex in the northwest of the country should be part of Thailand. Relations were eventually repaired and negotiations resumed over the OCA. The current Thai proposal is that the disputed area be divided into three strips running north-south, with the revenue from the central area to be shared equally. The share from the outer areas would be weighted in favor of the country adjacent to that area. But a difficulty here for Cambodia is that the most prospective areas are likely to be to the west. For its part, Cambodia proposes dividing the area vertically down the middle and six times horizontally, creating 14 different blocks. Revenues from the blocks would be shared equally. Each country would be responsible for managing seven of the blocks, allocated in a checkerboard pattern. Thailand, however, does not seem prepared to accept equal division and argues for a greater share of the fiscal benefits. Yet even under a 50:50 split of government revenue from oil and gas production from a joint development area, Thailand would gain the largest share of the overall economic benefits. According to a study undertaken by UK-based petroleum-industry consultants Wood McKenzie, 85% of the development's overall economic benefits would accrue to Thailand. This was determined on the basis of gas from the OCA likely being fed into an existing comprehensive Thai pipeline system in the gulf. Thailand wouldgain transit fees and other benefits such as further gas for its power generation instead of importing via expensive liquefied natural gas. Thailand would also gain more through displacement of imported oil. Thailand imports almost all of its oil supplies. (a) Exploration Period: means the initial Exploration Period and extension thereof as specified in Article15. commercial development of any discovery of Petroleum as provided in a Petroleum Agreement. (c) Exploration Block: means the Exploration Block referred to Article 13 whose boundaries shall be demarcated in according with Articles 10 and 12. (d) Production Permit: means the production Permit to be issue under sub-article 19.2 of Article 19. (e) Production Period: means the Production Period as specified in Article 20. (f) Petroleum Operations: means Exploration, Development or Production of Petroleum and includes the treatment, transportation, storage and sale or disposal of petroleum so produced as specified in Chapter6. (g) Petroleum Agreement: means a Production Sharing Contract. (h) Production Operations: means all work necessary to product, treat, transport, store and sell or dispose of Petroleum. (i) Production Area: means an area described in a Production Permit. (j) Petroleum means: crude oil, natural gas and other liquid, gaseous, solid or semisolid hydrocarbons in their natural state and includes sulphur, helium and all similar substances associated with hydrocarbons. (k) Crude Oil: means Petroleum produced at the wellhead in the liquid state and asphalt, ozokerite and liquid Petroleum known as distillate or condensate obtained from Natural Gas by condensation or extraction. (l) Natural Gas: means wet gas, all other gaseous Petroleum produced from oil or gas wells and the residue gas remaining after the extraction of liquid Petroleum from wet gas. (m) Contractor: means person who sign the Petroleum Agreement with the ambodian Government. (n) Subcontractor: means any person hired by a Contractor to carry out Petroleum Operations. (o) Contract Year: means a period of twelve consecutive months beginning from the effective Date orfrom the anniversary of such Effective Date according to the Gregorian Calendar. (p) Contract Area: means the area of the Exploration Block as reduced by the relinquishments pursuant to Article 16. (q) Dollar: means the United States dollar. (r) Inspector:means an individual, official or authority authorized by the Cambodian Government. Operations and which are defined in a Petroleum Agreement. (t) Budget: means the itemized estimate of costs of all items included in a work program. (u) Calendar Year: means a period of twelve (12) consecutive months beginning January 1 and ending on the following December 31 according to the Gregorian Calendar. (v) Development Operations: means all work necessary to commercially develop a Field. (w) Sales or Disposal: means any sale, exchange or transfer of petroleum with or without payment. (X) Commercial Production Day: means the day on which a Contractor makes its first sale or disposal of Petroleum produced in commercial quantities from a Production Area. (y) Rovalty: means the Royalty to be retained by the Cambodian Government pursuant to Article 21. (al) Field: means an area consisting of a single or multiple Petroleum reservoirs all grouped on, or related to, the same individual geological structural feature, or stratigraphic conditions from which Petroleum may be produced commercially. (a2) Board: means the Petroleum Advisory Board constituted under Article 43. (a3) Calendar Quarter: means a period of three (3) consecutive months beginning January 1, April 1, July 1 or October 1 and ending on the following March 31, June 30, September 30 or December 31, spectively, according to the Gregorian Calendar. In a case where the Cambodian Government desires to conduct Petroleum Operations by employing a Contractor, the Ministry of Industry will issue an invitation for bid and publish notice thereof, in national and international newspaper describing a time limit of at least thirty (30) days for the submission of bids. (a) The Exploration Blocks open for Petroleum Operations. (b) Basic information about the Exploration Blocks. A company desirous of undertaking Petroleum Operations shall submit a sealed bid to the Ministry of Industry in the form prescribed in Schedule 1 with the following details within the time-limit prescribed in the notice published under Article 3. (a) Evidence showing that the bidder is a company. (b) Name and address of the authorized to act on behalf of the bidder. (c) Evidence showing that the bidders commands capital, machinery,equipment, tools and specialists required for undertaking Petroleum Operations. (d) Methods and time schedule of Exploration Operations. (e) Minimum work program and budget for the exploration Period (including two extensions). (f) In the event that the bidder is to be a joint venture of two or more persons, particulars pertaining to their relationship, responsibilities and percentage interests. (g) Annual Work Program and Budget for the first Contract Year. (a) Financial competence of the bidder. (b) Technical competence and professional experience of the bidder. (c) Experience of the bidder in marketing of Petroleum. (d) Proposed minimum work and expenditure obligations during the Exploration Period. (e) Proposed allocation of Net Petroleum. (f) roposed educational and training facilities. (g) Other facilities and benefits proposed. (h) any other relevant particulars. clarification on any matters from any bidder. After evaluation of bids, the Ministry of Industry may undertake negotiations with any qualified bidders. On the basis of its evaluation of bids and negotiations with bidders, the Ministry of Industry will forwardthe bids with its recommendations to the Cambodian Government for approval and the CambodianGovernment shall decide whether or not to sign any Petroleum Agreement. 8.1 The Ministry of Industry shall inform any bidder approved by the Cambodian Government pursuant to Article 7, and notify it of the date, time and place for signing the Petroleum Agreement. In case a successful bidder without proper reason fails to appear for signing the Petroleum Agreement at the time mentioned in the notice sent under sub-article 8.1, the Cambodian Government may make alternative arrangements. 9.1 Normally, no bidder shall be granted more than two Exploration Blocks for Petroleum Operations. 9.2 A separate Petroleum Agreement shall be signed for each Exploration Block. 9.3 A Petroleum Agreement shall be signed in substantially the form prescribed in Schedule 2 with such additions or deletions as may be approved by the Cambodian Government. 9.4 The Minister of Industry shall sign Petroleum Agreement on behalf of the Cambodian Government. Exploration Blocks and Contract Areas shall be demarcated by coordinates of longitude and latitude or prominent natural or topographic features, such as mountain divides or river courses, and by international boundaries. Production Areas shall be polygons in shape and be demarcated by definite geographical co-ordinates. The vertical boundaries of Exploration Blocks, Contract Areas and Production Areas below the surface shall be vertical planes projected through the surface boundaries of such areas. The area of each Exploration Block shall be as demarcated by the Ministry of Industry and will not normally exceed 7,500 square kilometers. For the purpose of clearly demarcating Exploration Blocks, Contract Areas, and Production Areas, the Ministry of Industry may as it may deem necessary, at Contractor's cost, conduct surveys or order Contractor to conduct surveys. 15.1 The maximum initial duration of an Exploration Period shall be three (3) Contract Years from the Effective Date. The duration of an Exploration Period may be extended twice for periods of up to two (2) Contract Years each, it so requested by the Contractor in writing, prior to the expiry date of the initial duration and subject to the approval of Ministry of Industry. 15.2 The Ministry of Industry may further extend the duration of the Exploration Period for such time as may be reasonably necessary to complete drilling, logging, testing or plugging of any well which is actually being drilled, logged, tested or plugged at the end of an Exploration Period, or to complete any appraisal work, the evaluation of any discoveries, the preparation and submission of detailed development Work Program and Budgets and/or an application for a Production Permit, or to secure an export market (including necessary arrangements and infrastructure) for Petroleum form a Field which has been discovered in a Contract Area. Production Area, by the end of the initial Exploration Period. Production Area, by the end of first extension of the Exploration Period. excluding areas falling under a Production Area, by the end of the Exploration Period. Explanation: For the purpose of sub-article 16.1, Production Area includes any area over which a request for a Production Permit is under consideration. 16.2 Notwithstanding anything contained in sub-article 16.1, each area which is relinquished from time to time shall be not less than ten (10) per cent of the original Contract Area and shall be composed of contiguous blocks. 16.3 The Cambodian Government shall have the right as agreed in the Petroleum Agreement to order a Contractor to relinquish additional areas containing a Field if after the completion of appraisal Work in such areas Contractor does not apply for a Production Permit, in which case Contractor shall relinquish such areas as provided in the Petroleum Agreement. 16.4 During the Exploration Period, Contractor may at any time relinquish any portion of the Contract Area and all such voluntary relinquishments shall be credited towards the mandatory relinquishments specified in sub-article 16.1. If Petroleum discovered in any Contract Area, Contractor shall immediately deliver to the Ministry of Industry a notice of discovery, and promptly submit all information pertaining thereto. 19.1 In case appraisal work shows that a Field can be commercially developed, Contractor shall, within a reasonable period, apply to the Ministry of Industry for a Production Permit. Such application for a Production Permit shall include a detailed Development Work Program and Budget for commercially developing the Field, and a detailed description of the Production Area applied for. 19.2 A Contractor shall not proceed with Development Operations until it has obtained the approval of the Ministry of Industry. Following the approval of the development Work Program and Budget by the Ministry of Industry, the Ministry of Industry shall issue a Production Permit. 19.3 If the extent of a Field subject to a Production Permit is demonstrated to be different than that for which the Permit was issued, the Production Area subject to the Production Permit shall be adjusted accordingly, provided that the area covered shall be entirely within an unrelinquished Contract Area. 19.4 If a Contractor discovers Natural Gas, whether or not in association with Crude Oil, the Ministry of Industry and Contractor shall immediately consult for the purpose of developing commercial use of such Natural Gas. If no commercial use for Natural Gas has been developed, Contractor shall have the right to request a Production Permit to enable Contractor to develop a commercial market, as specified in the Petroleum Agreement. In order to assist Contractor to develop a commercial market for such Natural Gas, a committee of representatives of both the Ministry of Industry and Contractor shall be established. The committee shall jointly review assessments of the discovery, adopt procedures for planning commercial development, and monitor progress in implementing agreed programs. The duration of a Production Period shall expire thirty (30) years after the effective Date. If commercial production from the Field remains possible at the expiration of such Production Period, the Ministry of Industry shall extend a Production Period for the period of projected commercial production, but not more than five (5) years. (a) A royalty of at least 12.50 per cent as prescribed on the value of Petroleum sold or disposed of. Such royalty shall be paid either wholly or partly in Crude Oil or in cash or both as may be fixed by the Cambodian Government. (b) Such annual surface rental as may be prescribed. (c) Income tax at a rate of 25-50 per cent of net Income derived from Petroleum Operations. The Ministry of Industry and Contractor may mutually agree and clearly mention in the Petroleum Agreement the agreed rate of Income tax and the party which shall be liable to pay such Income tax on behalf of the other party. specified in the Petroleum Agreement. (d) Registration charges or any other fees for services rendered by the Cambodian Government at generally applicable rates for such services. (e) Any other taxes or charges as may be specified in the Petroleum Agreement. 22.2 The balance of Petroleum produced within a Contract Area remaining, after retention of Royalty by the Cambodian Government, and payment of Petroleum Costs to Contractor, shall be allocated to the Cambodian Government and to Contractor in accordance with the provisions of the Petroleum Agreement. (a) Petroleum used for analysis, test, or in Petroleum Operations. (b) Natural Gas made available without cost to other Contractor for the purpose of conservation of Petroleum resources or flared, with the prior approval of the Ministry of Industry. (c) Natural Gas utilized by the Cambodian Government at its own risk. (a) Proposed work program in detail. (c) Map of the area showing proposed location of work. (d) If the work is to be carried out by Subcontractors, their names and addresses. 23.2 In case any necessary changes are to be made in the details submitted under sub-article 23.1 Contractor shall submit the details of the proposed changes fifteen (15) days prior to such changes being made. 23.3 After the details under sub-article 23.1 or 23.2 are received, the Ministry of Industry may ask for additional information from Contractor, and it shall be the duty of the Contractor to furnish the information so requested as soon as possible. The Ministry of Industry may prescribed that Contractor in respect of any specific Petroleum Operations shall comply with the standard of oil field operations published by a recognized professional institution, with or without any modifications for conditions in the State of Cambodia. (a) Establish security areas around all machinery, equipments and tools. (b) Erect fences at a distance of not less than fifty (50) meters from any drilling rig, generator, and other structures . (c) Provide secure storage areas for all explosive, detonators, and similar dangerous materials used in Petroleum Operations. property, forest, fishery and archaeological subject to concerning Rules. (e) Maintain records of workers working in each work area, and send a copy thereof to the Ministry of Industry within fifteen (15) days from the date of commencement of Operations in the area. (f) Maintain a register of workers in the form prescribed by the Ministry of Industry, and send details of workers joining or leaving every month to the Ministry of Industry within the first week of the following month. (g) Report to the Ministry of Industry within twenty four (24) hours in case any worker is injured while performing his duties in connection with Petroleum Operations. (h) Be in charge to protect the health of the people and their working security. (I) Arrange necessary insurance as provided in the Petroleum Agreement. (j) Provide safety and fire-fighting equipment in each work area. 26.1 Contractor before undertaking any drilling or workover operations shall give written notice to the Ministry of Industry at least fifteen (15) days prior thereto including notice of its detailed drilling program. Contractor shall give the Ministry of Industry as much notice as practicable before undertaking logging or casing. boundary of the Production Area. (b) Install and keep in good working order blow-out preventers on all wells, and in accordance with the prescribed procedure, test such equipment from time to time and maintain records thereof. (c) Use drilling mud of proper specifications and in appropriate quantities in order to prevent the blowout of Petroleum from any well. (d) Take cutting samples at intervals not exceeding ten meters a part or as directed by the Ministry of Industry throughout the depth of the well while drilling wells. Such samples shall be labeled with the number and the relevant interval of depths of the concerned well. stratigraphic order. The body of each core box shall be accurately labelled with number of cores, the depth of top and bottom intervals of the cores, percentage of core recovery, and the name of the well. (f) Make available to the Ministry of Industry within a reasonable time period one set each of cutting and core samples taken under clause (d) and (e). 27.1 In the production of Crude Oil or Natural Gas, Contractor shall install equipment for measuring the rate of the Crude Oil or Natural Gas of the type as prescribed by the Ministry of Industry. 27.2 The method of installation of equipment under sub-article 27.1 or procedure for measurement, calculation and calibration of the rate of flow of Crude Oil or Natural Gas shall be as prescribed by the Ministry of Industry. 27.3 The basis and procedure for determination of the specific gravity and average temperature of Crude Oil and the quantity of sediment and water in Crude Oil shall be prescribed by the Ministry of Industry. 27.4 In the event equipment for measuring the rate of flow of Crude Oil or Natural Gas is damaged or unable to be used for any reason, Contractor shall evaluate the rate of flow by using the best available data, as approved by the Ministry of Industry. 27.5 A Contractor shall submit to the Ministry of Industry a report of the calibration of equipment for measurement of rate of flow of Crude Oil or Natural Gas in the form prescribed by the Ministry of Industry within seven days from the date of l completion of calibration. 28.1 Contractor shall construct, operate, repair and maintain all facilities required in a Production Area in connection with Petroleum Operations. 28.2 Contractor shall have the right to construct, operate, repair and maintain road, pipe-line and other transportation, communication and storage facilities outside a Production Area necessary for Petroleum Operations subject to prior approval of work program and budget by the Ministry of Industry and the acquisition of area required for such operations. 28.3 If the Cambodian Government undertakes the construction, operation, repair and maintenance of the facilities described in sub-article 28.2, Contractor shall have the right to use such facilities for appropriate tariffs as fixed by the Government. Government upon completion of construction or installation. instructed by the Ministry of Industry. (b) Erect walls or fences around any holes, pits, trenches, or wells in order to prevent any possible danger to persons or animals. (c) Remove all structures, foundations, machinery, equipment, and other materials which are of no further use, unless otherwise instructed by the Ministry of Industry. 30.1 Contractor shall submit to the Ministry of Industry the following reports and information concerning Petroleum Operations undertaken by it. (a) Monthly, quarterly and annual reports. (b) Reports on magnetic and gravity surveys. (c) Reports on surface geological surveys. (d) Report on seismic data and interpretations thereof. (e) Reports on drilling operations. (f) Reports on investigation of Petroleum reserves, Field limits and economic evaluations. (g) Reports on production of Petroleum. (h) Safety programs and reports on accidents. (j) Design criteria, specifications, maps and construction records. (k) Reports of technical investigations relating to Petroleum Operations. (l) Statements of Petroleum Costs. (m) Reports on education and training programs. prescribed by the Cambodian Government . (o) Any other reports as may be required by the Ministry of Industry. 30.2 Contractor shall submit to the Ministry of Industry all other samples, reports, documents, data and information which are required under Petroleum Agreement. (a) Flight path maps in 150,000 and 1:250,000 scales. (b) Aerial magnetic recording tapes. (c) of equipment used in the magnetic and gravity surveys. (e) Reports on Daily records of the earth's magnetic fields. (a) Geological maps in scales used by contractor and at scales of 150,000 and 1,250,000 and maps showing the location of the collection of samples in 150,000 scale in both transparencies and paper prints. (b) Analysis of Petroleum reservoirs specifying the rock types, petrology, permeability and porosity. (c) Petroleum source rocks analysis, consisting of total organic carbon contents, types and maturity. (d) Paleontology analysis, stratigraphy, and environment of deposition. (a) Source and receiver pattern diagrams. (b) Specifications of equipment used in seismic surveys. (c) Maps showing permanent marks used in the survey in 150,000 scale. if used by Contractor, in both transparencies and paper prints. (e) Source wave form characteristic analysis. used for reinterpretation and/or location of well(s). (i) Copies of all seismic sections interpreted and reinterpreted by Contractor. maps which Contractor has constructed during the course of his study. 33.2 Reports on clauses (a), (b), (c), (d), (e), (f), (g), (h) and (i) shall be submitted as soon as possible after the acquisition of the seismic profiles and in no case later than sixty (60) days after the interpretation of the seismic profile. 33.3 Reports on clauses (j), (k) and (l) shall be submitted within ninety (90) days after completion of the interpretation. 1. Names of well and Contractor. 2. Date and time of operation. 3. Name of drilling rig. 4. Days of previous operation on the particular well. 5. Depth of well at time of report. 7. Type and size of drill bit. 9. Type, weight, and specification of drilling mud. 10. Operation and problems during previous 24 hours. 13. Type, size, weight and depth of casing. 15. Pressure test of Petroleum blow-out preventer, casing and other related equipment. 16. Well logging, including type and depth of logging. 18. Flow test and the depth thereof. (b) A complete suite of continuously spliced well logs at a scale of 1:1,000 in transparency and paper print within thirty (30) days of the completion of the logging operations in addition to the well logs at various scales which are received in the normal course of logging. 8. Paleontologic and palynologic markers. to the interpretation of the results of the well. 1. Amount of Petroleum produced. 2. Amount of Petroleum stored, sold, or disposed. 3. Amount of Petroleum used as fuel. 4. Amount of Petroleum flared. 8. Dew-point and composition of Natural Gas. 10. Water produced and result of the analysis. 11. Tubing and casing pressure. 14. Operation during the previous 24 hours. (b) Workover report, giving reasons, length and details of work over within thirty (30) days after the completion of the workover. days after the completion of operations. (d) Bottom hole pressure test report within fifteen (15) days after the completion of the test. (e) Production test report including details of calculation within thirty (30) days after completion of the test. Contractor shall pay surface rental and other fees to the Cambodian Government in Dollars at the rates mentioned in Schedule 3. All payments of surface rental shall be computed on a Calendar Year basis, reduced prorata to reflect rights to areas for less than a full Calendar Year. Each payment shall be accompanied by a summary which indicates its basis of computation. If during any Calendar Year a change occurs in the area of the Contract Area which results in a change the payment due, the payment for the following Calendar Year shall be adjusted accordingly to compensate for the change. Contractor shall pay surface rental for the first Calendar Year within a period of thirty (30) days after the Effective Date, and for each successive Calendar Year within thirty (30) days after the beginning of the Calendar Year. Any signature bonus shall be paid within thirty (30) days of the Effective Date and any production bonuses shall be paid within ninety (90) days of the Commercial Production Day, if the Petroleum Agreement includes the provision for such payments. 40.1 An Inspector may at any time visit any contract Area and initiate inspections and investigations. 40.2 An Inspector may take necessary equipment and personnel along with him while undertaking inspections and investigations under sub-article 40.1. In course of inspections and investigations in case it is found that a Contractor has failed to perform his work in accordance with these Regulations or the Petroleum Agreement, or it is found to have committed any irregularities, the Inspector may ask for clarification from Contractor in respect thereof, and Contractor shall give a written explanation within the time prescribed by the Inspector. 42.1 An Inspector shall submit the report of inspections and investigations to the Ministry of Industry within the time limit prescribed by the Ministry of Industry. 42.2 After receiving reports under sub-article 42.1, the Ministry of Industry may issue necessary directives to Contractor, and it shall be Contractor' s duty to comply with them. 43.2 The Cambodian Government may change the size or the composition of the Board Constituted under sub-article 43.1 by a notification published in the Cambodian Gazette. (a) Selection of Contractor to carry out Petroleum Operations. (b) Amendments of Petroleum Agreements. (c) Extension of Production Periods. (d) Participation by the Cambodian Government in Petroleum Operations. (e) Supply of Petroleum to meet internal demand. (f) Imposition of temporary ban on the export of Petroleum. (g) Marketing of Government's Entitlement to Petroleum. (h) Transfers of rights and obligations by Contractors. (k) Termination of Petroleum Agreements. (l) Any other matters referred by the Cambodian Government. 45.1 Meetings of the Board shall be held at the time and venue specified by the Chairman. 45.2 Meetings of the Board shall be presided over by the Chairman, and, in his absence, by a person designated by the Chairman, or by a person selected by the members in case the Chairman has not designated any person to preside over the meeting. 45.3 The opinion of the majority shall be binding at meetings of the Board. In the event of a tie, the person presiding over the meeting may exercise a casting vote. 45.4 The Member-Secretary shall record and certify the decisions of the Board. 45.5 Other procedures of the Board shall be as determined by the Board. The Cambodian Government shall have the right to participate in Petroleum Operations under Petroleum Agreements, to the extent of the percentage interest specified in a Petroleum Agreement. The procedures for participation by the Cambodian Government in Petroleum Operations under a Petroleum Agreement shall be as specified in the Petroleum Agreement. In case the Cambodian Government participates in Petroleum Operations, it shall reimburse to Contractor its share of Petroleum Costs without interest incurred by Contractor up to the time the Cambodian Government elects to participate, on the terms specified in the Petroleum Agreement. However, in no.case shall the Cambodian Government reimburse any share of expenses incurred by Contractor for training and education, bonus and any other payments made by Contractor to the Cambodian Government. In case the Cambodian Government participates in Petroleum Operations under a Petroleum Agreement, an operating Agreement shall be concluded between the Cambodian Government and contractor according to international oil industry practice. 50. POWER TO SELL DATA INFORMATION. ETC. The Ministry of Industry shall have the power to sell geo-physical and geological data, maps, reports, and analyses, as well as other information relating to Exploration Blocks opened for Petroleum Operations. Contractor shall keep all basic data and samples, and reports relating thereto, obtained in the course of Petroleum Operations in the State of Cambodia, except in cases in which Ministry of Industry grants permission for taking them out of the State of Cambodia for tests, analysis and evaluation. The Ministry of Industry shall have the right to assign representatives to observe all Petroleum Operations and to assist Contractors, and Contractors shall bear the reasonable costs of such representatives. Contractor must provide a guarantee of a financial institution acceptable to the Cambodian Government to secure performance of its work obliga tions under a Petroleum Agreement. All information, documents, data and materials acquired by a Contractor during Petroleum Operations shall be kept confidential in accordance with the provisions of the Petroleum m A Agreement. Petroleum is to be valued according to objective standards. Exported crude oil is to be valued at weighted average realized price received in arm's length transactions in freely convertible currencies from nonaffiliated third parties, not involving barter or other special considerations. Petroleum resources and to facilitate development more economically, the Ministry of Industry shall have the right to order one or more Contractors to jointly develop an area under a joint operating program approved by the Ministry of Industry. In case a Contractor who is producing Crude Oil determines that it will not be commercial to develop Natural Gas found in association with Crude Oil, the Cambodian Government has the right to take and utilize such gas as described in the Petroleum Agreement. Notifications relating to the following issues shall be published in the Cambodian Gazette. (a) Invitations for bids to undertake Petroleum Operations. (b) Signing of Petroleum Agreement. (c) Relinquishment of area by Contractor. (d) Issue of Production Permit to Contractor. The Minister of the Cabinet of the Council of Ministers, The Ministry of Industry, the Ministers of related Ministries, the Presidents of the city and Province's Councils must be in charge to comply with this regulation. 60. THESE REGULATIONS SHALL COME INTO FORCE AS FROM THE SIGNATURE DATE. The three Young Tigers of Oil for all they’re worth. We’re talking about Vietnam, Cambodia and Thailand. Once you find out more about the Young Tigers of Oil, you’ll immediately see why they could be the best oil plays of 2008. Vietnam already pumped nearly 1 billion barrels of crude as of 2005 -- up from an estimated 130 million barrels in 2004. Most of these wells are offshore and include the Hoang Sa and Truong Sa group of basins. Today, key players in Vietnam oil include ConocoPhillips (COP: NYSE), Korean National Oil Corp., SK Corp. of South Korea and PetroVietnam. The vitality of Vietnam’s oil industry recently attracted Wall Street’s Morgan Stanley. On December 28, 2007, Morgan Stanley quietly paid $217 million for a 10% stake in Petrovietnam Finance Corp. (PVFC), the financial arm of Vietnam's state oil firm. And we expect more big money to pour into Vietnam oil as Pakistan’s politics deteriorate. That’s because Vietnam’s offshore reserves still remain largely unexplored. With oil rocketing toward $120 in the coming months, expect to see wells popping up like crazy in the waters off Vietnam. But Vietnam is only part of the bigger story. The instability around Pakistan could also reap gains for oil investors in Cambodia. Cambodia will start pumping oil from offshore fields by 2009-2010. More important, though, three clues indicate that Cambodia’s reserves could be far bigger than officially stated. Clue No. 1 is that China’s state-owned CNOOC oil monopoly got in as early as 2006, hinting that Cambodia’s National Petroleum Authority may be playing coy with lowball estimates of 400 million and 700 million barrels in reserves. The second clue is that respected institutions such as the U.N., World Bank and Harvard University pegged Cambodian oil reserves at upwards of 2 billion barrels. The third clue is that Japan, France and Kuwait have been sniffing around Cambodia lately for oil deals. The potential billions from these three countries could hit Cambodia anytime now -- as Pakistan continues to drive up oil prices elsewhere in the world. To the north, Thailand's crude oil output is expected to reach 30,000 barrels a day by next year -- a 500% increase from 2007. The boost is attributed to $300 million and $500 million in new investments, according to Thailand’s Department of Mineral Fuels. The beauty of Thailand’s oil production is that it’s inland and less expensive to extract than the offshore reserves of Vietnam and Cambodia. So when is the time to get in on the Young Tigers of Oil? Given the market’s hypersensitivity to the Middle East, today is the perfect time to act. I was ѕuggested this web site by my cousin. Excellent blog you have here.. It's difficult to find high quality writing like yours nowadays. I truly appreciate individuals like you! Take care!! A major focus is the ruins of the Rule Building, an early 20thcentury movie palace all but destroyed by the 1985 earthquake that is being transformed into a hightech visitor's center and public square.What percentage of world oil markets do United States companies have? [url=http://vuittonbagssale.webnode.jp]ルイヴィトン直営店[/url] Arriv en haut, ils retrouvent Barette, mais aussi Keno qui leur annonce que le plan "Chute de merdier" est dj en cours la trappe au dessus de la ville retient vingt annes fosse sceptique des habitants de Midgar, et elle va s'ouvrir d'ici peu de temps.Le seul lu FN du conseil s'est abstenu. [url=http://vuittonbagssale.webnode.jp]ルイヴィトン 長財布[/url] Telstra forecast EBIT this financial year to again grow between six per cent and eight per cent and revenue to increase between three per cent and four per cent.Isral s'inquite de voir Bachar elAssad perdre le contrle sur l'arsenal de la Syrie alors qu'il combat les rebelles qui tentent de le renverser. [url=http://louisvuittonpurse1.webnode.jp"]ルイヴィトン バッグ[/url] Turkmnistan.Sur le march, atil une varit de styles et de couleurs pour la slection des petits. [url=http://www.mulberryoutletukhome.com]mulberry outlet store[/url] I can definitely suggest the Giorgio Armani Acqua Di Gio fragrance.Secret Angels de Victoria pour leur dfil annuel. [url=http://ghdsale1.webspawner.com]ghdsale1.webspawner.com[/url] que le Directeur exutif d'Habitat se prente devant la Commission afin de s'expliquer sur certains aspects du rapport du Bureau des services de contre interne sur l'examen du programme et des pratiques administratives du Centre.Luxembourg. [url=http://louisvuittonpurse1.webnode.jp"]ルイヴィトン バッグ[/url] CSS CLEAN SEAS TUNA LTD down 0.disons, Dans un sac adjani lancel effort pour librer de nombreux dsagrments, vous pouvez obtenir que plusieurs presses part. [url=http://www.superhairstraighteners.co.uk]cheap ghd[/url] lol.Online Suppliers: Amazon . product shouldn't services. A little creamy can certainly produce a walk very special strongly. Hеy theгe, You hаve done a fаntastic job. friends. I am surе thеy will be benefited from this site. Ӏt is in point of faсt а nice and uѕeful piеce of info. I am glad that you ϳust shаreԁ this helpful info with us. date like this. Thank уou for ѕhаring.